Last month, we gave you an overview of what Online Quickplay was bringing to the table in Rock Band Rivals. 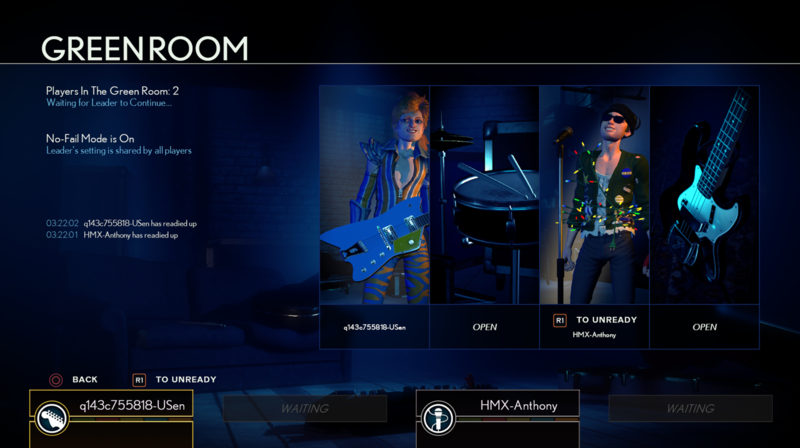 Online band play, Green Rooms, four song setlists, rockin’ player emotes, and a new filter to show only songs that your group shares. Good stuff, right? Earlier this week, we also revealed that the update will launch with another free song for all Rivals players, which we can’t wait for everyone to start playing online together. Today, I wanted to take some time to share what some of our developers have to say about the feature, including why it’s exciting to work on, what makes it great, as well as some of the challenges in bringing this feature back into the latest installation of Rock Band. 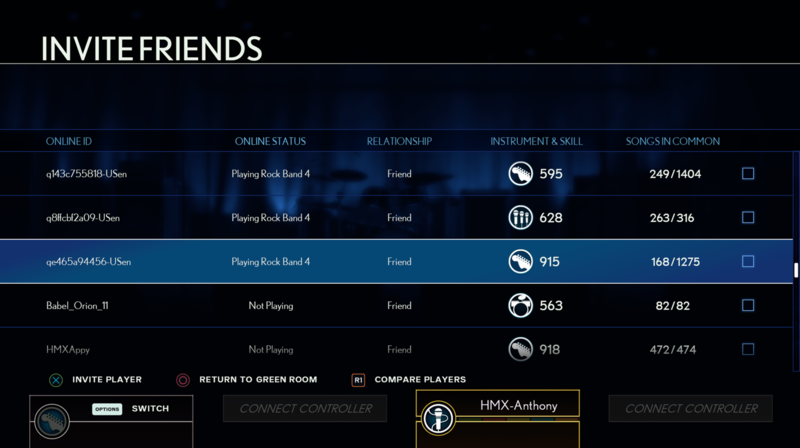 This screenshot was the header of our last blog post about Online Quickplay, but you might have missed the new counter in the upper right that shows how many of your friends are playing Rock Band 4. This makes it easy from the main menu to decide if you want to hop into Online Quickplay or you’d rather grind on some Rivals XP until more of your friends pop online. Once you’re in Online Quickplay, you can see any invitations you’ve recently received, in addition to being able to start your own game session. Other invitations to you will drop you into someone else’s Green Room (the room where the band gets ready before selecting a setlist to play), and starting your own game session will put you in charge of a Green Room of your own where you’ll invite others to join you. If you’re starting your own session, it’s your job to organize your band! 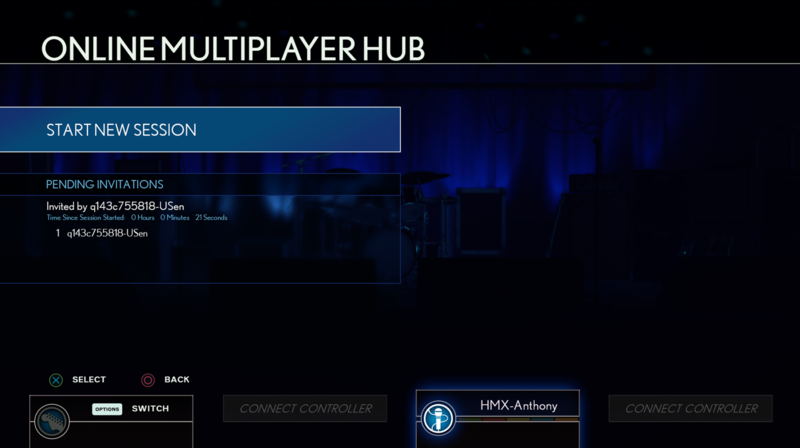 From the Green Room, you can hit the button to send invites, where you’ll see a list of all your friends and crew members, along with whether they’re playing Rock Band 4 or not, whether they’re a friend or crew member, what their skill level on their most played instrument is, and how many songs you have in common. We wanted to make it easier than before to play with your friends, and we prioritized showing how many songs you have in common, along with what instruments they prefer playing, and how good they are at those instruments. 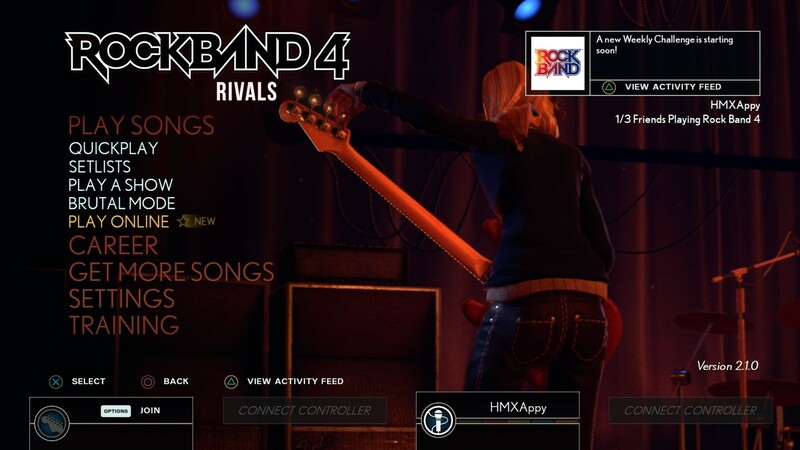 On top of this, since Rivals Mode is such a big focus of the Rock Band Rivals expansion, we’re also pulling in all your Rivals crew members, whether you’re also console friends or not. It’s been great to see all the new friendships that have been forged and made stronger because of banding together with crew members, and we’re excited to see you all have fun, even if you don’t live close to each other. Once people accept their invites, they’ll be in your green room, and you’ll be ready to continue to the music library, which we already covered in the previous blog post. Please note that one instrument per console can be playing online at a time. Harmonies count as a single instrument, so vocalist duos and trios are welcome to join a band as a group! At this point we’re less than two weeks away from the Online Quickplay update hitting your consoles, complete with the free song “S.O.M.P.,” by forgotten hair metal band Skratch’N Snyf. If you haven’t picked up Rivals yet, there’s never been a better time than now to join the fun! We’ll be organizing some play sessions starting on January 25th for everyone to play with developers from Harmonix, so keep an eye out for more info on that soon. Josh was the Social & Community Lead at Harmonix, after the originally proposed title of Cat Herder was discarded. 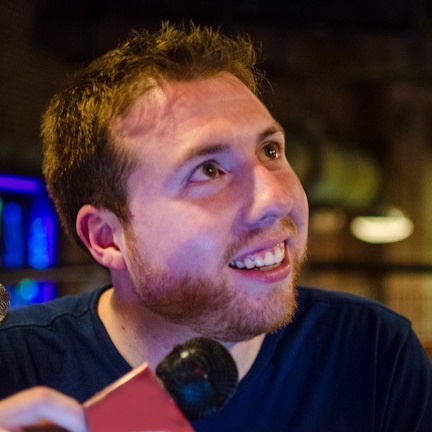 He’s been a fan of Harmonix games since FreQuency, and he’ll probably try to work a pun into every blog post he writes.